Laser alignment assures the correct location and articulation of a shaft bearing. Many consider running-gear alignment to be a black art. At a yard I once managed, I clearly recall watching a contractor, who specialized in this work, take a decidedly seat-of-the-pants approach to “calculating” shaft weight and the associated sag or droop. When it comes to ensuring that an inboard propeller shaft and its supporting bearings are properly installed and aligned, there might be some art, but there’s no magic. The practices and procedures are straightforward, and if you take care to ensure accuracy and precision, the results should be predictable. There are essentially two types of alignment. The first is positioning the engine relative to the shaft. The second is more difficult: adjusting the shaft bearings and/or their supports. Engines and motor mounts are designed to accommodate some adjustment. Most mounts employ jacking screws that allow for a narrow-range change of elevation. Side-to-side adjustment is often facilitated by the mount’s elliptical-base fastener holes—again, with a limited range. In this type of adjustment the engine is moved relative to the position of the shaft, because the shaft’s position is assumed to be nonadjustable. 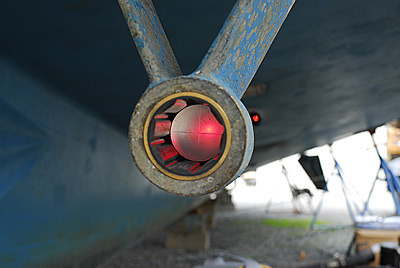 Unless the installation includes a thrust bearing of some sort, all the thrust created by the propeller is transmitted to the vessel’s hull via the motor mounts. 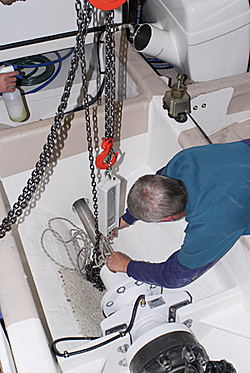 The boat is pushed through the water by virtue of the mounts and their associated hardware. Keep this in mind as you select and install components. Because you should tighten all fasteners with a torque wrench, avoid thin fender washers that are easily distorted when you install mounts. Likewise, through-bolts, locking nuts, and machine screws should be favored in place of self-tapping lag screws. Because of the pressure and leverage imparted on motor mounts, installers and those performing adjustments should avoid maximum extension of the mount’s adjustment screw thread, which could cause cyclical loading-induced failure. 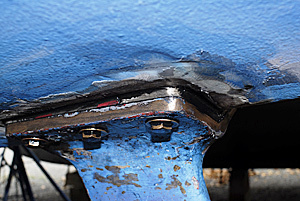 If more of the mount’s adjustment screw threads are visible under the engine support bracket than on top of it, a shim should be installed beneath the mount’s foot plate to close the gap. Ideally, when adjustments are complete, the engine bracket should rest somewhere in the middle of the adjustment stud. Shim material should be rugged, incompressible, and resistant to splitting or fracturing. Steel or aluminum plate works well; prefab FRP such as GPO or G10 is also suitable. Avoid high-density polyethylene, including King Starboard and other non-reinforced plastics. Coarse adjustment of this motor mount was performed with a composite shim. The face of the transmission output coupling and the face of the propeller shaft coupling must be parallel, or made parallel, to within no more than 0.004″, or 0.1mm (rules of thumb for this calculation vary; the stated figure is from a shaft manufacturer). Inspect the faces for damage, scoring, corrosion, dents, and distortion of any sort. Any irregularities will make it difficult, if not impossible, to measure for alignment analysis. What’s often not well understood about alignment is the requirement that the theoretical centerline of the shaft to be centered on the transmission output coupling. Yard personnel often ask, “How difficult should it be turn a shaft and prop when the vessel is blocked?” I know a shaft that’s too tight when I encounter one, but that’s not a helpful answer to others making a determination whose results could lead to costly repairs. Here’s a rough rule of thumb that I go by: provided the vessel is properly supported, and the bearings are lubricated with diluted dishwashing detergent, even large shafts—say 2.5″ (63.5mm) in diameter, 18′ (5.5m) long, and supported by three bearings—should move with no more effort than an adult can impart with one hand. That’s subjective to be sure. Recently, I was able to lift my entire body weight off the ground in an attempt to turn a 3″-diameter (76mm) by 18′-long two-bearing shaft installation. Clearly it was too tight, and the bearings and shaft likely needed realignment. Shaft alignment is typically thought of as nonadjustable. As mentioned earlier, that’s not strictly true. When the shaft supports, strut, or keel/shaftlog-mounted cutless bearings are installed, their position should be carefully chosen to ensure that they are parallel and share the same theoretical shaft centerline. If the bearings are not aligned with each other, if they are not parallel, or if they deviate from the shaft centerline, the shaft and/or bearings will be distorted during installation. The classic pinched bearing is an indication of that, as is the shaft that’s exceptionally difficult to turn from the propeller end. The distortion induces a range of maladies, including excessive bearing and shaft wear, vibration, increased drag, and diminished fuel efficiency and performance. If the bearings are not properly aligned with the shaft at the time of initial construction or installation, then they or their supports, the struts, shaftlog- or keel-mounted bearing(s), must be repositioned. While this wouldn’t strictly fall under the definition of “adjustable,” modifying the position of these bearings becomes the only means of resolving the misalignment. So, shaft alignment is adjustable, but not easily. I’ve supervised many shaft and support realignments. While there are several methods, my preference is to begin by assessing the misalignment with a laser alignment tool. The full procedure is beyond the scope of this article, but in short: by placing a laser in the aftmost cutless bearing, with the shaft out, and pointing it toward the engine, you can determine, with purpose-made targets, if the aftmost bearing and any intermediate bearings are properly aligned. The laser pinpoint should land in the middle of the transmission output coupling as well as the targets placed in any intermediate bearings, confirming that the theoretical shaft centerline is aligned with the output coupling centerline. Engine alignment also can be confirmed by installing the laser in the coupling shaft bore and shining it aft to targets placed in the bearings. A final engine alignment must still be confirmed by coupling clearance measurement after the vessel has been launched and running gear components have settled. Yards that routinely confirm or adjust shaft alignment typically make or have made a series of targets and jigs to support and aim lasers through and onto a variety of bearing and coupling sizes and types. If a bearing is out of alignment, from either a centerline or parallel point of view, it must be adjusted. 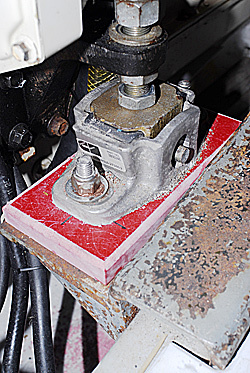 If the bearing is strut-mounted, the strut must be removed and a base wedge of cast epoxy or fabricated FRP installed to relocate the bearing. Again, repositioning is confirmed with a laser and target. The strut must be held firmly in place, with the laser on target, until the epoxy cures. Afterward, the waxed strut is removed, cleaned, and bedded and fastened in place. If the bearing is mounted in a keel or shaftlog, the process can be more challenging; however, casting in the realigned position remains the order of the day. In some cases, a section of shaft can be used to align both ends of a keel- or shaftlog-mounted bearing during the casting process. This strut was shimmed to reposition the bearing. A final variable to consider is shaft sag. The shaft section that lies between the forwardmost bearing (in a multiple-bearing installation) and the coupling will droop or sag under its own weight and the weight of the coupling. If the droop is not corrected before the shaft and transmission couplings are aligned, then a bow, or curve, will be built into the finished assembly. If you’re skeptical of just how much a shaft can droop, allow the length of shaft from the bearing to the transmission, with the coupling installed, to hang off a sturdy workbench or table. Then measure the difference between the distance from the floor to the shaft at the table and the floor to the shaft as it enters the coupling. The result is the droop. Sag can be factored out by aligning the centerline of the transmission output coupling with a laser shot from the cutless bearing. If a laser shaft alignment has not been carried out, and if the shaft has not been removed, the droop can be negated by calculating the weight of the unsupported shaft (shaft weight data is available from all shaft manufacturers; one example is http://www.wbmetals.com/faqs.asp#Tip11), dividing that by 2 (because one end of the shaft is supported), adding the weight of the coupling, and then lifting, or “neutralizing,” the weight using an industrial hanging scale or compression scale under the shaft. Applying a calculated lift can offset shaft sag while aligning running gear. For example, 4′ (1.2m) of 2″ (51mm) shaft weighs 42 lbs (19 kg), divided by 2 is 21 lbs (9.5 kg), plus the weight of the coupling—which we’ll say is 22 lbs (10 kg)—equals 43 lbs (19.5 kg). Lifting 43 lbs at the coupling end of the shaft will negate the effect of the droop. In practice, the droop is negligible for small-diameter shafts and for shafts whose unsupported overhang is comparatively short, making the above procedures unnecessary. For long spans and heavy shafts/couplings, those steps are worth the effort. Roughly one-third of the new vessels I encounter suffer from some form of shaft misalignment—either misaligned bearings or shaft droop. The next time someone mentions checking alignment, take a moment to discuss exactly what’s meant and what’s involved in ensuring alignment is right in every respect.